Potatoes are indigenous to the Andean regions of Peru, Chile and Bolivia, extending northward to the southern Rocky Mountains. Cultivated potato, Solanum tuberosum L., is a highly heterozygous tetraploid (4x = 48), belongs to the Solanaceae family together with other crops like tomato and peppers. Potatoes are adapted to an array of climates and are utilized in many ways. The potato tuber is not only the principal mean for potato propagation, but also a major human food source. Potatoes are mainly propagated by vegetative methods (cloning). Potato tubers have nodes or �eyes� from which the new growth begins. The new stems growing from each �eye� are called sprouts which giver rise to the new plant. Vegetative seed can be either a whole tuber or a cut tuber. Physiological age of seed is influenced by growing conditions, handling, storage and cutting procedures, and it has an impact on how the new crop grows. 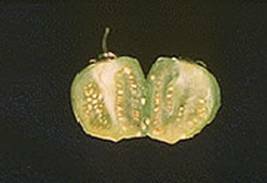 Sexual propagation occurs by means of botanical or sexual seed. Most potato cultivars produce fruit; each seed will develop into a plant with unique characteristics. This is a process very useful in crop improvements in breeding programs, but its genotypic variation is of little value to growers. 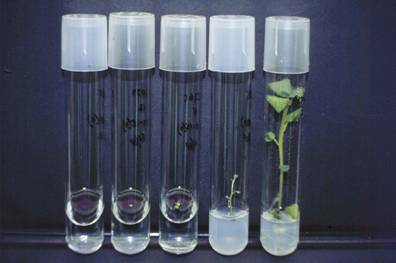 Tissue culture is another method which permits a very rapid propagation. This method is used to maintain disease free seed stock, which can be then stored �in vitro� and be used when is needed. Potatoes are indigenous to the Andean regions of Peru, Chile and Bolivia, extending northward to the southern Rocky Mountains. Potatoes purportedly came to North America via Bermuda in 1691. Cultivated potato, Solanum tuberosum L., is a highly heterozygous tetraploid (4x = 48), belongs to the Solanaceae family together with other crops like tomato and peppers. Potato is an annual dicot when grown for botanical seed, but is treated as a perennial because the vegetative propagation from tuber for commercial purposes. Potatoes are adapted to an array of climates and are utilized in many ways. There are cultivars developed for different environments and end uses. Because of the wide adaptation and many species, a vast genetic resource can be called upon for introgression of resistance to disease and insect pests, stresses, as well as improvement of quality traits. The tuber is not only the principal mean for potato propagation, but also a major human food source. Potatoes are mainly propagated by vegetative methods (cloning). This is the primary commercial propagation method. Vegetative reproduction ensures a uniform crop, contraire to what would happen with sexual propagation. Sexual propagation of potato is accomplished by planting its �true seed�, but a high variability exist between this seed and that is why is not commonly used. However, sexual seed is becoming more and more popular; especially in places were disease pressure is very high and maintaining disease free seed is becoming a problem. When potato growers talk about �seed� they are talking about the tuber and not the botanical or sexual seed. Potato tubers are actually a modified stem with approximately 70-75% content of water and a remaining 25-30% of dry mater. They have nodes or �eyes� from which the new growth begins. The new stems growing from each �eye� are called sprouts. Sprouts grow from the tuber after a period of dormancy after they are harvested, this varies largely between cultivars. After this dormancy is broken, sprouts grow and when planted, they give rise to the plant stems and from there all the vegetative part of the plant. Underground, lateral shoots called �stolons� are formed, from which the new tubers will be formed. Vegetative seed can be either a whole tuber or a cut tuber. The standard seed piece used by growers is 2� by 2� or 2 oz. Research has shown that a seed piece this size has the adequate amount of carbohydrates levels for shoot initiation and growth. If the tubers are cut, the usual procedure is to let the cut pieces to suberize or cure, for about 10 days. 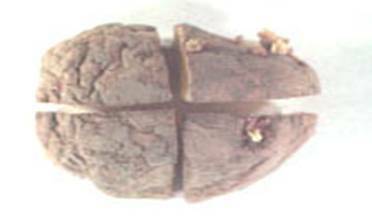 Suberization in tubers allows them to develop a corky layer around the seed piece that prevents the seed piece decay by the entrance of several kinds of pathogens. Is not the chronological age of the seed piece; instead, is the influence of the growing environment of the seed. Physiological age of seed is influenced by growing conditions, handling, storage and cutting procedures. Physiological age of the seed will have an impact on how the new crop grows. It is very important to manage the physiological age of the seed because it has a big impact on how the new crop is going to look like and it will probably, along with many other factors, determine weather the crop will be of a high quantitative and qualitative value. Other than seed age, there are some pros and cons when talking about vegetative reproduction, some of them include the fact that cloning assures genetic purity and product uniformity, it also favors high yields. Some of the disadvantages are that cloning favors disease spread (e.g. viruses, bacteria, fungi), and also a significant amount of storage space, transportation and heavy planting equipment is required. Most potato cultivars produce fruit but some are pollen sterile or fail to ser fruit for other reasons. If fruit is established, they usually are small, up to 1.25 �in diameter and are green colored, resembling a small tomato. The fruit contains the true seeds of potato plants, containing approximately 300 seeds per fruit. When the potato plant reproduces, usually through self-pollination, the chromosomes (along with the genes they carry) are randomly distributed to the seeds. Each seed will develop into a plant with unique characteristics. This is a process very useful in crop improvements in breeding programs, but its genotypic variation is of little value to growers because a new plant could be totally different to the mother plant and no uniformity would be seen in the field. Some of the advantages that true potato seed have are that they don�t carry any diseases and that seed can be stored in small places contraire to what happens with tubers. Tissue culture permits a very rapid propagation. Under traditional propagation, one tuber yields approximately 8 daughter tubers in one growing season, while with tissue culture, 100,000 identical plantlets can be produced in eight months, that when transferred to the field, could produce 50 MT of potatoes. Each plant has a root system, leaves and terminal points or growth points. 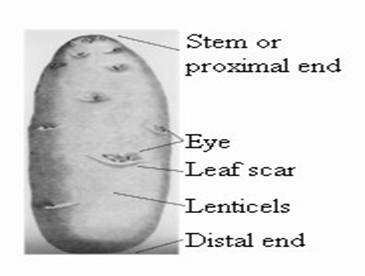 There is an apical meristem found at the apex of a potato stem and it also has lateral growth points. Each of these buds has a meristem which allows it to become a different plant. The process of this technique is very simple. Disease free plantlets are grown in test tubes on a nutrient media. Each plantlet is cut into 3 to 10 nodal sections after 18-60 days. Each new cutting is planted in a new test tube. This can be repeated until the desired number of plantlets is obtained. Plantlets are then removed from the tubes and grown in sterile soil and let them complete their entire growth cycle. Tubers produced are collected and stored to later be sold to growers. This is also the process followed to obtain certified seeds. This first seed lot would be called �nuclear seed� and then after harvesting the product of this seed you get �Generation 1� (G1) and so forth. Meristems have no vascular system, therefore are less prone to viral, fungal and bacterial infections. For this reason this method is used to maintain disease free seed stock, which can be then stored �in vitro� and be used when is needed. Hoopes R.W., Plaisted R. L. 1987. 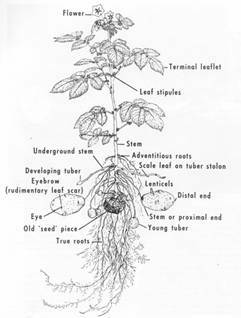 Potato (Chapter 11) subtracted from the book: Principles of Cultivar Development Volume 2 by Fehr W. 1987. Iowa State University. Stark, J.C. and S.L. Love, editors. 2003. Potato Production Systems. University of Idaho Agricultural Communications, Moscow, Idaho.